It’s the holidays, and you know what that means? Advent calendars! Not the usual chocolatey kind though, this one by Eric Wastl is for programmers. Put your coding skills to the test and solve a challenge each day before December 25th. My solutions are pretty sloppy, but it gets the job done. I was gonna do them each day, but I only did the first and had to do the rest today because I was busy all week, but at least I’m all caught up now. Can’t wait for the next challenge! Yesterday Let’s Encrypt finally went into public beta. Let’s Encrypt is a certificate authority that helps you to automatically get and install free SSL certificates for your web server. Currently the support is somewhat limited for automatic installation, it has plugins for Apache and Nginx, and for other servers you can use other automated ways of getting your free certificate. The certificates are valid for 90 days, but you are free to renew whenever you want to, and with it being totally automated you can set up a simple script running the renewal every 60 days and you should be set. I decided I wanted to try it out on this site, and I was up and running in about 15 minutes. Now I have a script that runs every two months renewing the certificate. It’s super simple. I kind of forgot to blog for a while. I got sick, lost interest in running for a little while. I’ve also been having problem with my right knee after running, but I think I’ve sorted that problem out for now, I will have to remember to keep stretching to keep my knee from hurting. Since the last post I ran my first 10km race ever, and two other races as well, a 7km and a 5km. The first race was Premiärmilen where I ran my first 10km race ever. My goal was to finish in 1:10:00, which I managed. My official time was 1:08:35, which I am more than happy about. The second race I ran was Ältasjön runt, a 7km run which I finished in 47:36, also happy about that. Last week I ran a 5km race in Saltsjöbaden, called Nacka Halvmarathon. I was aiming for about 33 minutes, but I managed to finish in 31:29, which was faster than I anticipated, I was able to keep a really quick pace during the last kilometer. Who knows, maybe there’s more races to come, or maybe this will do for this year. I ran after work, this was a day of running intervals. I was supposed to run for 3 minutes and rest for 3 minutes. The first few intervals I was able to keep running during the rest, but toward the end I powerwalked instead. In total it felt great and I did an extra interval just for the hell of it. Everything felt great, I was full of energy and felt I could run the prescribed 40 minutes with ease. Started to get a bit heavy toward the end, but I probably could’ve kept going. High speed long intervals run. I was supposed to run for 10 minutes at a high speed, rest for 5 minutes, then run for 10 minutes again. This run felt fairly good. I felt I managed to complete the run as instructed and kept a fairly high pace for me. Didn’t feel good at all, my legs felt weird, I was tired, the runt went really sluggish. I didn’t finish the 40 minutes prescribed, I only managed 20 minutes of running. Next week I will focus harder and complete all the runs. Next saturday I go to London and I really look forward to running there. About two weeks ago I decided I wanted to start running more. I’ve been running off and on for about two years, with mixed result, but I’ve never taken it very seriously. Last week I decided I need a goal, something that will keep me motivated when things gets tough. That’s why I signed up for this year’s Midnattsloppet in Stockholm. My goal is to finish the race without stopping (if I can help it), I don’t care about the time this year. Midnattsloppet is a yearly race taking place on a late summer evening in Stockholm, spanning 10 kilometers of city roads, and bringing thousands of people running and watching. This week was my first training for it, and for these two first months I’ve decided to follow the “Running 4 Fat Loss” exercise schedule on Runkeeper to help build some stamina and lose weight in the progress. This first week consisted of 4 days of running at a steady pace for 30 minutes. I will write a report of my progress every sunday, below follows the first report. After a day of heavy raining the skies cleared up enough tonight to do some observing. The air was quite moist, but I really wanted to get some observing in so I went out anyway and grabbed my friend to come join me. Today I managed to get the scope aligned using the “Easy Align” mode quite quickly, only took me two tries. After aligning the scope tracked the stars semi-well, I had to do small adjustments every now and then to keep things in the middle. Still not having any planets to observe, and the moon not being high enough in the sky yet I decided to have a look at some double stars I’ve read about. The first one I picked was Albireo, a colorful pair of stars that really stood out with their nice yellow and blue colors. The scope performed nicely getting me pointed in the right direction, and then I just had to fiddle a bit with the focusing knob. 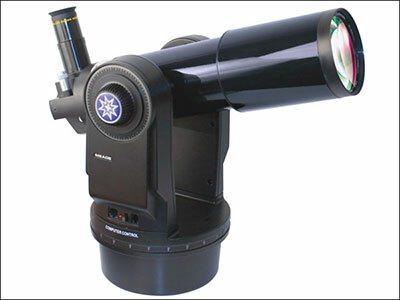 Yesterday I did something great, I bought my first telescope. So far I’ve been using binoculars and my telephoto lens on my DSLR to look at the heavens, but yesterday I finally bought a telescope, something I’ve been wanting to do for a long time. I settled for the Meade ETX-80AT-TC, it was one of the better beginner scopes I could get my hands on in the near vicinity. I’ve only used it for about an hour so far, so this is truly my first impression. That’s usually the first thing people learn to write in any programming language, so I find it quite fitting for the first post of my new blog. It’s powered by Octopress, the “blogging framework for hackers”. At the moment I’m using the standard theme, but I will create my own in the future, just hang tight and keep watching this space.